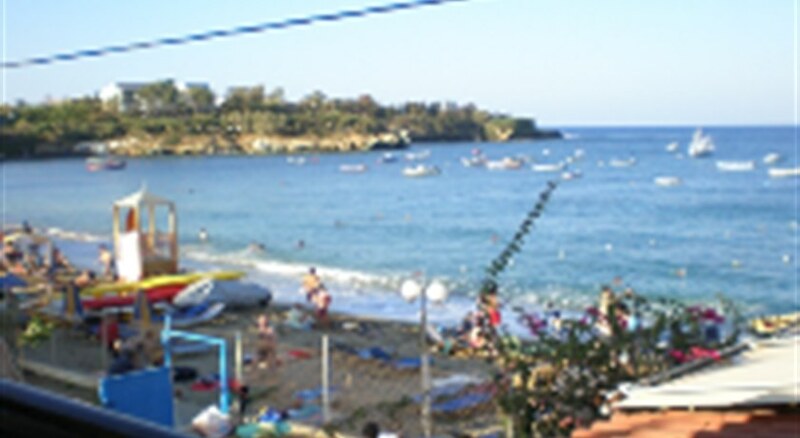 Studio complex located directly at the beach in the Cretan resort of Agia Pelagia. The Thania Studios is a family hotel built at the centre of Agia Pelagia beach, just a few steps from the sea. It is also situated 20 km. west of Heraklion town centre and 12 km. to Arolithos city. The nearest airport is 25 km. from the hotel. The complex features a reception area with rental safe and fax/photocopy services, garden, tavern and on the rooftop there is a pergola, tables and chairs. The studios are equipped with A/C (extra charge), TV, kitchenette with fridge, safe (extra charge) balcony and bathroom with shower. There is a parking area close to the hotel (extra charge). Address: 71500 Agia Pelagia, Crete, Greece.